View of Tenby Castle in Pembrokeshire. Tenby Castle was built in 1153 upon the site of an earlier fortification, and was greatly extended in the 13th century with the heightening of walls and the addition of towers. 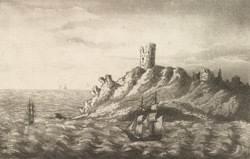 The Castle has impressive defences, stands on a rocky promontory and is connected to the mainland by a narrow peninsula. One of the entrances to the castle is a five arched gate protected by a D shaped barbican and the castle complex also consists of a watch tower and a great hall.